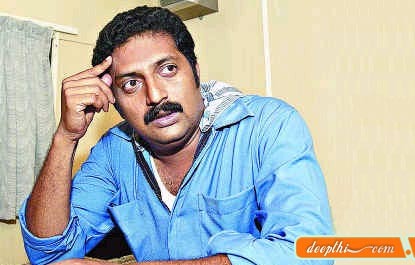 Prakash Raj is a famous Actor, Producer in South India, He has acted in Kannada, Tamil, Malayalam, Telugu, and Hindi films. He is a Kannadiga and known as "Prakash Rai" in Karnataka. But he has become a famous villain in Tamil and Telugu. He is considered to be one of the most natural actors in the film industry, and has a good reputation for his acting skills. He was also a part of Mani Ratnam's stage show, Netru, Indru, Naalai. Recently he took on the mantle of producer and has produced 3 movies in Tamil (Kollywood). Out of the 3 movies he produced 2 are Box-office hits and also are critically acclaimed. His movies have gained a reputation of being decent and watchable with the wwhole family. Also as a producer, his selection of movies typically have natural storylines. He is now producing a movie named Poi (lie in english) which is directed by his mentor and veteran director K. Balachander.